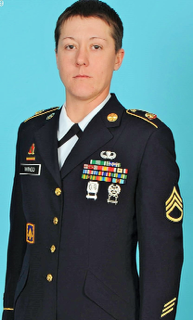 SSG(P) Nancy A. Wingo was born in Athens, Ohio and graduated from Alexander High school in 2001. She joined the military and attended Basic Training in September 2001 at Fort Jackson, South Carolina. Her Advanced Individual Training for Patriot Launching Station Enhanced Operator at Fort Bliss, Texas. After training, SSG Wingo was assigned to Alpha Battery 2nd Battalion 43rd Air Defense Artillery Fort Bliss, TX, where she served as a Patriot Launcher Crew Member, Orderly Room NCOIC, Supply Room NCOIC, and CBRN NCOIC. While in this unit she deployed to Iraq in support of Operation Iraqi Freedom. In late 2002 she was assigned to Charlie Battery 2nd Battalion 43rd Air Defense Artillery and served as a Patriot Launcher Crew Member and System Maintenance NCOIC. In 2007 she was assigned to Charlie Battery 1st Battalion 43rd Air Defense Artillery where she served as the Battery Master Driver, Primary Armor, Launcher Section Sergeant, and Patriot Master Gunner. While serving in this unit she deployed to UAE in support of Operation Enduring Freedom and was also recognized for winning the Brigade NCO of the Year Competition for 11th Brigade. In 2011 SSG Wingo was assigned to the 3rd Battalion 4th Air Defense Artillery Regiment Fort Bragg, NC, where she served as a Patriot Master Gunner, Tactical Control Assistant, Battery Sexual Harassment/Assault Response and Prevention NCO, Weight Control NCOIC, and Safety NCOIC and also won the Brigade NCO of the year fiscal year 2013 for 108th Brigade. SSG Wingo’s military schools include: Combat Life Saver, Warrior Leader Course, Standard Army Maintenance System, Airborne, Combative Level 1, ULLS-G Operator Course, Unit Amorer Course, Patriot Master Gunner, SHARP Course, and Advanced Leadership Course where she won the Mitchell W. Stout Leadership Award and graduated on the Commandant’s List, as well as Senior Leadership Course graduate on the Commandant’s List. Her awards and decorations include Parachutist Badge, Wheeled Vehicle Driver Badge, Overseas Service Ribbon numeral 2, Army Service Ribbon, Noncommissioned Officer Professional Development Ribbon numeral 3, Global War on Terrorism Service Medal, Global War on Terrorism Expeditionary Ribbon, Iraq Campaign Medal, Korean Defense Service Medal, National Defense Service Medal, Army Good Conduct Medal 4th award, Presidential Unit Citation Navy, Army Commendation Medal 6 Oak leaf clusters, and Army Achievement Medal 9 Oak leaf clusters. SSG Wingo currently serves as the Fire Control Platoon Sergeant for Charlie Battery 3rd Battalion 4th Air Defense Artillery Regiment, Fort Bragg North Carolina.